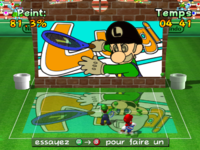 Artist on the Court is a sport minigame found in Mario Power Tennis. 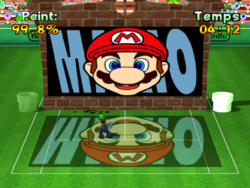 The minigame takes place in the grassy Peach Dome with a huge mural in the middle of the court. 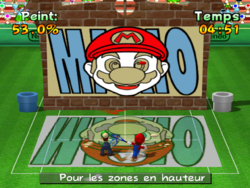 The player must paint the mural by shooting paint balls that appear from Warp Pipes, with the colors accorded to the original picture that appears on the ground. 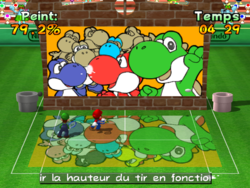 Once the player finished painting with their respective colors as the original picture, the game finishes. In the Wii version, the player gets 10 minutes instead of 5 to finish it. Whichever color ball has been hit, that color will automatically fill in the rest of the color pieces. 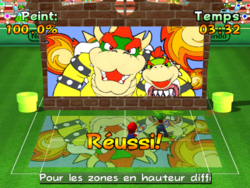 Single Player: The player must finish the mural painting in a restricted period of time in order to unlock another stage and make a time record. 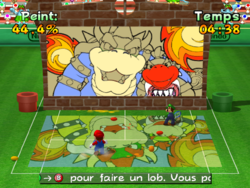 Multiplayer: Players must finish the mural painting in order to make a time record; however, this mode does not unlock another stage. 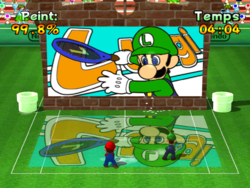 The music played on this court is a remix of the music of Princess Peach's Castle from Super Mario 64. This page was last edited on March 23, 2019, at 12:02.